How does climate change impact the health and welfare of our animals? This topic will be discussed for the first time as veterinarians gather in Adelaide for the annual conference of the Australian Veterinary Association (AVA), which will feature a workshop looking at the impacts of climate change on agriculture, human and animal health. From koalas and possums to cows, sheep and our cats and dogs at home, the workshop will look at the dangers climate change poses to all animals. The workshop embraces the One Health theme, a concept which brings together animal, human and environmental health experts to address global issues such as climate change. 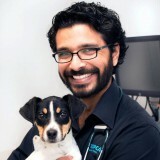 It is being organised by Australian Veterinarians in Public Health (AVPH), a special interest group led by Dr Guy Weerasinghe. “We are very excited about the opportunity to host this game-changing workshop. Veterinarians need to play an active role in the discussion surrounding climate change, and can help those managing livestock and companion animals,” said Dr Weerasinghe. Although mainly targeted at veterinarians, the conference and workshop are relevant to anyone involved in agriculture, environmental science and other medical professionals. Workshop participants will gain access to the latest research on climate change: from its impacts on animal health and welfare to adaptations to maintain food security. Key speakers: Prof Mark Howden, Dr Peter Hayman, Associate Prof Craig Williams, Prof Colin Butler, Dr Melissa Nursey-Bray.